Your Data: Are You Protected? So once again, a user’s data was saved because he did the right thing. 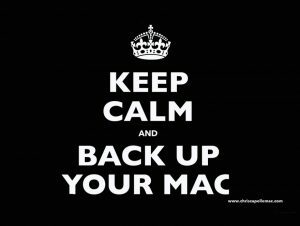 But once in awhile, there is no backup, which means the recovery process is tedious, expensive, or not possible. I don’t like being a nag or a noodge, and using the expression “broken record” is a term that’s no longer relevant (despite the recent resurgence of vinyl albums), but it’s imperative that you MAINTAIN A REGULAR BACKUP OF YOUR DATA!! One of the great things the engineers at Apple did was to integrate the backup into the operating system, which makes it simple and as painless as possible. It’s a “set & forget” process; as long as your computer is on and the the backup source is attached, then your computer will back up on its own. But there are certain things you have to consider when planning your backup scenario. The most common (and least expensive) option is simply connecting an external hard drive (commonly a USB model) to your Mac and configuring the Time Machine settings in your System Preferences. This is a fail-proof method, as long as you keep your external hard drive attached to the computer (at least once in a while). For desktop models, you simply set the drive up behind the computer and then forget about it. But for laptops, manually connecting the external drive to your computer and allowing it to complete the backup process is another step that you have to remember. Also, if you’re in an office or household with multiple laptops like so many of us are, it’s a matter of buying an external drive for each computer (a 1TB external drive is around $60), or share a single drive among the users. However, that defeats the purpose of “set & forget” (not to mention the possibility of filling up the drive quickly), so Apple has come up with the next level; its AirPort Time Capsule, a combo wireless router/backup device. Currently available in 2TB and 3TB versions, it can be configured to back up any number of devices connected to it. While the Time Capsule may seem like the idea solution, it does have a couple of drawbacks. For one, it may not be feasible in an environment that is networked with devices other than Apple branded ones. (There certainly are many non-Apple network backup devices available on the market; they have various degrees of ease of configuration.) Also, similar to a local drive, if there is a fire or theft, your data is gone along with your computer, not an enviable position to be caught in. That leads us to cloud backup. There are scores of cloud backup services out there; the trick is to to find the one that best suits your needs. Some are expensive; some don’t back up large data files such as photo libraries and email databases. Some offer the option of recovered files to be shipped out on an external hard drive; some are all of the above or none of the above. Any data backed up on the cloud takes time to recover (particularly large files), so you have to factor that into your decision making process.